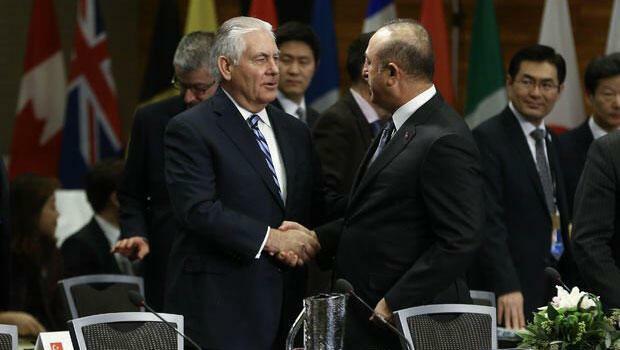 The United States and Turkey agreed on the formation of new mechanisms to normalise relations between the two countries, Foreign Minister Mevlüt Çavuşoğlu told a news conference after meeting U.S. Secretary of State Rex Tillerson. “We reached an agreement on normalising our relations,” Çavuşoğlu was quoted by secular newspaper Hürriyet as saying. Tillerson expressed his country’s desire to work together with Turkey in Syria, but also emphasised his concerns about Turkey’s domestic situation. “Those guilty of carrying out the 2016 coup attempt need to be tried in a transparent manner,” he said, adding that he had raised his concerns about the arrests of local staff at the U.S. consulate in Turkey and of the high number of people who had been arrested under the ongoing state of emergency. Çavuşoğlu later said the number of arrests was unrelated to the state of emergency and that European countries had also instituted such measures after terrorist attacks. Relations with Turkey had been in a state of crisis recently, Tillerson emphasised, and said repairing them was very important. Ankara'da bir araya gelen Dışişleri Bakanı Mevlüt Çavuşoğlu ve ABD Dışişleri Bakanı Tillerson, görüşmenin ardından ortak basın toplantısı düzenliyor.